Laura Hills was born in Newburyport, Massachusetts in 1859. Although she was known for her miniature painting, she was also interested in pastels at a very early stage in her career. 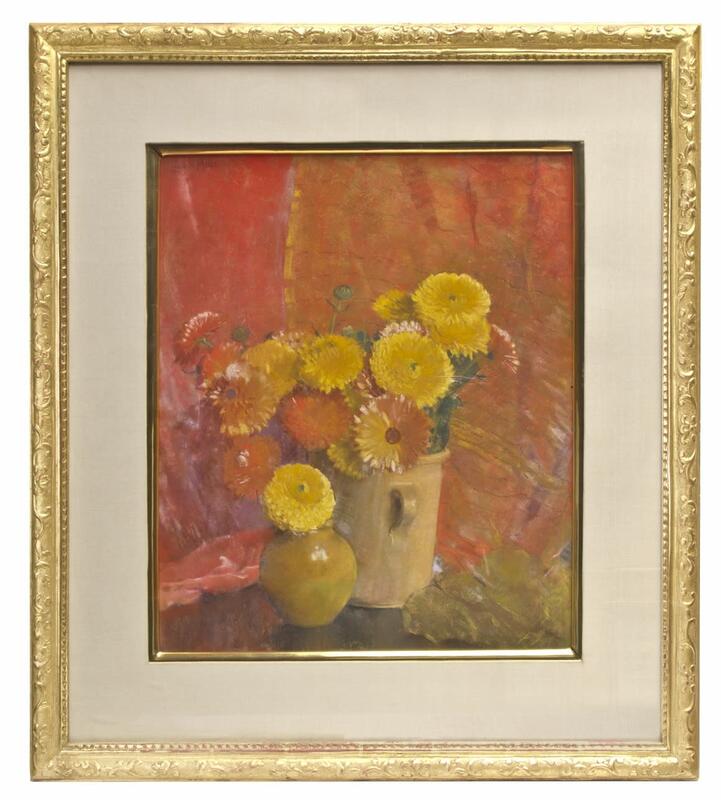 In her advanced years, she took this early interest and worked with pastels and flowers to paint her oft-spoken desire to create "portraits of flowers". Laura Hills began her artistic studies with Helen Mary Knowlton, William Morris Hunt's most important student. She then studied at the Cowles Art School and the Art Students League with William Merritt Chase. Hills was awarded many medals of honor during her career. In 1899, she helped to found the American Society of Miniature Painters and became its first vice-president. She was also a member of the Woman's Art Club and an Associate Member of the National Academy of Design. Hills exhibited regularly at Doll & Richards, the Copley Gallery and the Guild of Boston Artists. These shows were well known for their speedy "sell-outs". Her works were also shown at the National Academy of Design, the Pennsylvania Society of Miniature Painters, and the Boston Society of Arts and Crafts. The artist continued to exhibit new works through 1947 when she was eighty-eight. The works of Laura Hills are found in many public and private collections including the Boston Museum of Fine Arts. The artist was well represented in "The Bostonians: Painters of an Elegant Age, 1870-1930," which traveled from the Boston Museum of Fine Arts to the Denver Art Museum and the Terra Museum of American Art, Chicago. An editorial in the November 23, 1939 Boston Herald stated: "Some how she manages to bring dancing sunlight and vibrant atmosphere within the four walls and to soak her flowers in it. One artist has said that New England and the United States have never produced her equal." Indeed, Laura Coombs Hills was one of this country's most sought after flower artists. Calendulas displays the best qualities of Hills' mature work. A master at capturing the essence of whatever flower or vase she chose for her composition, Hills has deftly portrayed the elegance of the smallest details without being "heavy-handed" with her pastels. 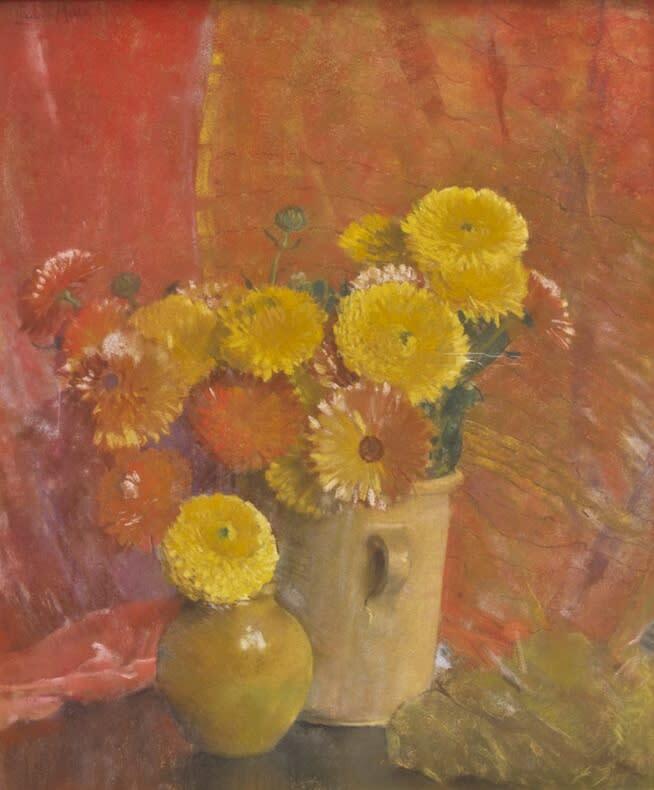 In this example she has ably depicted the brilliantly color keyed calendulas or "marigolds" and captured the subtle nuances of "gesture" as the flowers naturally appear in the pottery vases of different sizes, shapes, and surfaces. Capturing these various qualities on paper required a sureness of touch and a mastery of technique that was the artist's hallmark. There is nothing artificial or contrived in this composition where Hills has carefully arranged all the shapes and positioned the flowers, a difficult task which points out the extraordinary accomplishments of this artist. The overall effect is one of rich warm colors in a complex composition that sports opposing yet complimentary materials and textures. This picture is clearly one of Hills' most fully developed and spectacular compositions.